Experience Swann's innovative thermal-sensing motion detection technology with the SWNVK-875804. Swanns True Detect PIR Thermal-Sensing technology detects motion by heat, such as from people & cars, to trigger recording and push notifications. This cutting-edge technology virtually eliminates false triggers, like plants moving with the wind, to only capture events with security relevance. Plus, get amazing image definition with 5 Megapixels, which is 2.4x better than 1080p Full HD (2MP). Zoom in closer with incredible clarity to license plates, facial features and clothing patterns. Now its even easier to see what's happening using voice commands via the Google Assistant (using your Smartphone or Google Home) and your Chromecast device. You can customize commands such as Ok google, show me the front door and then stream video from the cameras to your smart TV. 8 Channel 5MP 2TB NVR Security System with 4 Outdoor Thermal-Sensing Bullet Cameras Experience Swann's innovative thermal-sensing motion detection technology with the SWNVK-875804. Swanns True Detect PIR Thermal-Sensing technology detects motion by heat, such as from people & cars, to trigger recording and push notifications. This cutting-edge technology virtually eliminates false triggers, like plants moving with the wind, to only capture events with security relevance. Plus, get amazing image definition with 5 Megapixels, which is 2.4x better than 1080p Full HD (2MP). Zoom in closer with incredible clarity to license plates, facial features and clothing patterns. Now its even easier to see what's happening using voice commands via the Google Assistant (using your Smartphone or Google Home) and your Chromecast device. You can customize commands such as Ok google, show me the front door and then stream video from the cameras to your smart TV. 8 Channel 5MP 2TB NVR Security System with 4 Outdoor Thermal-Sensing Bullet Cameras is rated 4.0 out of 5 by 10. Rated 4 out of 5 by Denn383 from Happy with product Have only had this system a couple of weeks. Followed "Read Me First" instructions and everything worked as it should. Only have two of the four cameras installed so far. I have a 1080 TV but the pictures look very good close to the house. I'm not seeing the detail I was hoping I would get at a distance. A better TV might be needed. I'm still learning how to make adjustments to the NVR menu (100 pages of online instructions to print out) The cat5 cable is an issue. Instructions say don't bend it over 90 degrees. It comes with 180 degree bends every 4 inches. See picture. Looks like it was coiled then mashed down to fit in the box. Hard to straighten out the kinks when running it to the cameras. Rated 5 out of 5 by Jim B. from So Far So Good... System installed & configuration went very well, easy to program. The App works pretty good (opposite of what online reports indicated), easy to configure. Considering the price, this system is good value. Rated 4 out of 5 by Tim L. from Thermal Sensing the ONLY Way To Go A year ago I purchased a system from a different company. After setup I found that the standard motion detection recorded any movement (spider web, spiders, bugs, shadows, light change). I planned on the system to be an intruder alert while at home. There are so many ways that movement can set off the system that it is basically just a recording system in case there is an actual intruder. I had to turn off the buzzer alert as it was always going off. 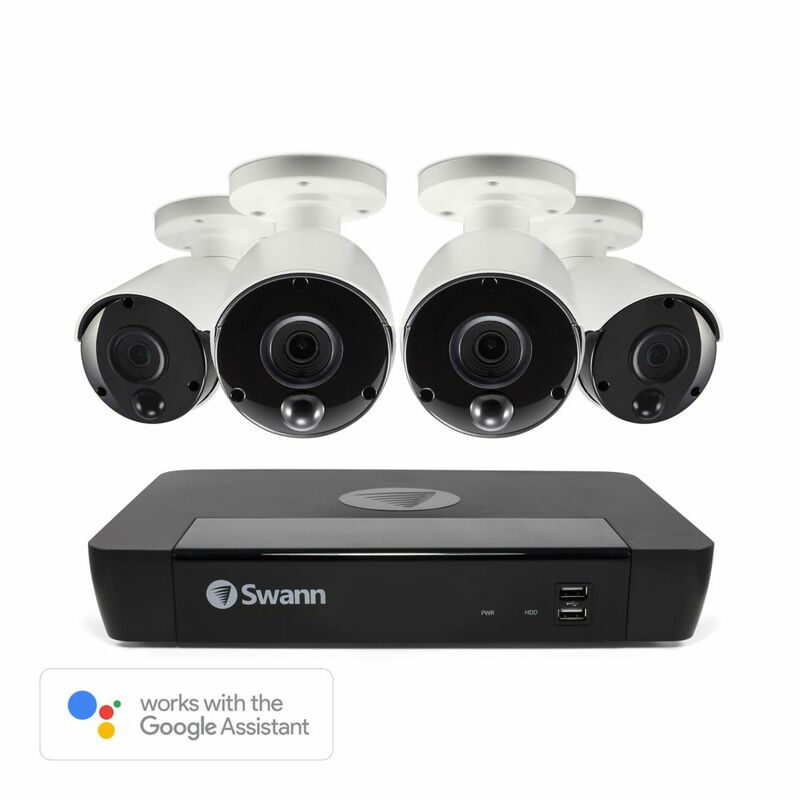 I just purchased and am in the middle of installing the Swann system with Thermal Sensing Cameras in my sonâ€™s dental office. In my testing of the camera triggering, between just motion and motion with thermal detection, I found very few if any false triggers. The thermal detection makes all the difference. Rated 5 out of 5 by Ben O. from Swann installation After doing the difficut part-preparing aplace on a brick/block wall--installing the cameras was a breeze. All worked out of the box, excellent images. very pleased with the product.. Rated 4 out of 5 by Scott R. from Good System I've had this NVR for a few weeks now and overall satisfied with it, but a few "Pros and Cons". Rated 1 out of 5 by Warricke J. from Nvr not working! Remote access not working! !